Necromancy, also called the Necromantic Arts, Dark Arts, or Dark Practice, is the manipulation of the souls or corpses of the dead. Dragons know it as alok-dilon. Different groups and cultures have varying positions on what exactly constitutes necromancy. In its broadest sense, necromancy can be understood as any form of soul manipulation. Some might consider it a subset of the conjuration school of magic, as both involve the summoning of spirits and utilizing the powers of Oblivion. However, necromancy is more generally understood to connote the manipulation of the souls of mortals and the reanimation of their corpses. Typically, this soul manipulation is accomplished by binding a soul to a physical form which has been prepared by the necromancer. Necromancy has generally been considered immoral and illegal in most cultures, as it is believed to contravene the natural process of life and death and violate the sanctity of spirits. However, there have been significant exceptions, and various disreputable groups have employed necromancy as a tool of war throughout history. Much of the knowledge of it is often attributed to Daedric influences, specifically Molag Bal. Molag Bal is also the father of vampires, undead creatures who often practice and have a heightened affinity for necromancy, or work alongside necromancers. Vampirism is often understood to be a form of necromancy. The debate over necromancy has been raging in magical circles for centuries. Advocates of the Dark Practice decry its censorship, lamenting the sacrifice of knowledge at the altar of public opinion. One argument they've been known to give is that attaining a proper and ethical understanding of necromancy is vital to best combat the menaces who have given the practice such an infamous reputation. They downplay the dangers associated with it, and criticize what they see as the fictional divide between necromancy and some other schools. Conjuration, Enchantment, Mysticism, and possibly others have some link to necromancy. Opponents emphasize that it is not censorship, but caution and ethics which demand that necromancy be prohibited to all but the wisest and most trusted mages, and then only to combat the exercise of the Dark Practice by others. They also highlight that any institution of magic risks its own survival by disregarding the overwhelming public sentiment against necromancy, and that it is simply impossible to "dabble" in the practice without corrupting one's own soul, as even the simplest of spells require the spilling of blood. Thus, despite the intertwined nature of the schools, any study of necromancy is inherently too extreme to be wise, and delving into it virtually guarantees the destruction of the practitioner. The soul, or animus, is the animating force of the universe found in all creatures. The mysteries of this force are not just unknown to mortals, they are unknowable as they transcend the limits of mortal knowledge. Every mage who has tried to unlock the secret behind souls has vanished without a trace. However, mages need not know their secret in order to harness their energy. While modern students of conjuration are content to harvest and utilize the "white" souls of lesser creatures, necromancy is the branch of the arcane arts which is concerned with the harvesting and use of the "black" souls of mortals. Individuals from all civilized races in Tamriel have practiced necromancy. Some of the more intelligent uncivilized races, such as goblins, have also demonstrated an aptitude for it. Masters of necromancy can reanimate long-dead subjects, though most practitioners require a fresh corpse, typically someone who has been dead for no more than three days. Attempting to raise minions without proper knowledge and training can result in an incomplete binding of the soul, leading to a break in the master-minion relationship and allowing the reanimated corpse to turn upon the necromancer. Necromancy draws the eye of people from many paths, such as the pursuit of power. Though necromancy can grant limitless resources in theory, it is no more powerful than the other broad disciplines of magic (though this does not stop people from pursuing the black art). Throughout history all over Tamriel, protectors of the people have been forced to seal off and abandon crypts rather than contend with the hordes of undead which necromancers have raised within. Necromancers have long sought to refine their skills and find new ways to utilize their craft. How necromancy is practiced is ultimately determined by the practitioners' goals, capabilities, and morality. Many simply want power. Skilled necromancers can summon whole armies of undead, given enough resources. It's typical for necromancers to have specific scientific experiments and objectives they are pursuing (at the start, at least). Necromancy also attracts sadists who are simply seeking the thrill of inflicting pain, and many necromancers who do not start out this way eventually give in to the soul-corrupting effects of the Dark Practice. One of the driving motivations behind necromancy is the pursuit of resurrection. Many necromancers take up the craft because they are desperate to bring back the people they loved. While tales suggest some necromancers have delved into resurrection with a small measure of success, as they can bind a soul back into the same body which held it in life, achieving "true" resurrection is not within their purview. Among the many things necromancers have learned over the eras is that the ability of a necromancer's servant to follow directions seems to be related to the servant's intelligence in life. Therefore, performing necromancy on animals produces guard dogs at best, or instruments of the summoner's destruction at worst. Skeletons must be properly prepared before they are reanimated, otherwise they could be structurally unsound. All of the crucial bones must be present and placed correctly. Necromancers also employ a variety of means to fasten together and reinforce the skeletons at strategic points so they can move properly. While most undead can be raised again and again, skeletons are relatively fragile, and can rarely be animated more than once. Necromancers often show a preference for skeletons, though, because they are cleaner than zombies and similar fleshy thralls, and they are swifter in a fight. Necromancers often employ animals, such as mudcrabs in Morrowind, to strip unwanted flesh off of corpses. If a corpse is too decayed to be used properly, but would prove a suitable servant as a skeleton, necromancers can simply dump the body near a marsh and allow the local creatures to prepare the bones for them. Necromancers have found ways to reanimate moderately decayed and even dismembered corpses by using leather straps to fit parts back together and catgut to stitch up gashes. It's even possible to reanimate a body which has been cobbled together from the living flesh of multiple creatures. Still, these "zombie" servants are relatively dull-witted and weak. If a necromancer invests a little time and effort, he can mummify a corpse. After soaking the body in a salt bath for at least a month, the vital organs are removed, and the body is wrapped in linen. Once the corpse is reanimated, the result is a stronger, more durable servant which is more capable of understanding commands and taking independent action. Necromancers have developed a great deal of innovative ways to manipulate souls. For instance, a necromancer can reanimate a corpse by conjuring frost around a human corpse, and then imbuing a loyal spirit into the frost instead of the body. The resulting servant can only perform the most basic tasks, but requires relatively little necromantic knowledge to create. Ascending to lichdom is a risky endeavor, unique in some ways to each necromancer who attempts it. It requires extraordinary willpower and necromantic knowledge, as well as a magical relic of great power and a plentiful amount of living souls. The necromancer casts a powerful necromantic spell on his subjects, using the magical relic as a casting focus. The spell is designed to steal living souls in an incredibly painful process. This is intentional, not incidental: for the rite to work, the soul must be wrenched from its body as painfully as possible. Collecting and egregiously torturing an abundance of souls in this manner is said to be crucial in the "ascension" to lichdom. Another important facet of becoming a lich is that the necromancer must transfer their own soul into a physical object. 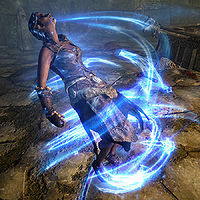 Tamrielic folklore has long acknowledged this, but tales often perpetuate the misconception that a lich can be killed by destroying that physical object. In truth, the necromancer is only dependent upon the object holding their soul during the transference (the length of which varies with each necromancer). Once the transference is complete and the necromancer's soul has left his body, the ascension to lichdom is completed, and the physical object holding the soul becomes inconsequential. The lich is born: a corpse that is self-reanimated by the soul it bore in life. If, however, the object holding the necromancer's soul should be lost or destroyed before the transference is complete, this ascendancy to lichdom would fail, and the necromancer would immediately die. Necromancers have been known to perform a nearly week-long ritual as part of their ascendancy, wherein they create a special hourglass known as the Sands of Resolve to act as the receptacle for their soul. The Legend of Vastarie centers upon a contemporary of Vanus Galerion and Mannimarco who sets an interesting example as a compassionate necromancer. While Mannimarco sought power through the direct application of necromantic energies, Vastarie sought, and found, a way to delay the release of a sentient soul upon death so that it might be consulted, and its knowledge recorded for the ages, before it was peacefully allowed to enter Aetherius (as opposed to permanently binding it in an enchantment). Working with subjects who have died a natural death is preferred by many necromancers, if for no other reasons than it takes less effort and attracts less attention. It seems that Vastarie, though, actively sought to avoid tormenting or permanently binding souls, and her aim seemed to be to benefit society rather than accrue power for herself. She could not abide Mannimarco's goals for the Dark Practice, but she also found that Galerion would not tolerate her experiments in the Mages Guild, despite the safeguards against abuse she had developed. She managed to gather a small group of students, but Mannimarco's burgeoning underground network and promises of power proved much more effective at recruitment. Vastarie eventually disappeared, and her former friend's cruel brand of necromancy continued to spread through Tamriel. Another example of responsible necromancy is the use of "practical" necromancy by members of the Undaunted during their exploits. Their view of necromancy is that it is but another branch of magic, whose beneficial applications are overshadowed by its' taboo nature. Few Undaunted would shy away from such magic if it means the difference between life and death. indeed, some of the techniques they teach to their members have a basis in necromantic magic. Despite necromancy often being associated with evil people, the Undaunted were put into a positive light as they became known for raiding the greatest dungeons in Nirn, Oblivion, and even obscure places like the Clockwork City for plunder and glory. As a result they earned a great reputation for stopping many threats. Although reanimating the dead has been practiced in some form since before the advent of written history, most of the earliest laws regarding necromancy banned it upon pain of death. It was banned by the Psijic Order, who considered it both dangerous and heretical. Later, the Mages Guild would also ban the practice. This ban technically remained in place for the Guild's entire history, though some archmagisters of the Guild over the years were satisfied with ignoring it, while others were even suspected of practicing it in secret. And regardless, various independent mages have explored necromancy throughout history. Mannimarco and Vanus Galerion met in the early years of the Second Era, when they were students of the Psijic Order. They became bitter enemies when Mannimarco began to raise and manipulate the dead, which Galerion and the Order condemned, resulting in Mannimarco's expulsion. Mannimarco went to mainland Tamriel, where he began forming the Order of the Black Worm. It's suspected that the rise of necromancy throughout the continent is one reason why Galerion was allowed to form the Mages Guild in the first place. As Mannimarco spread his influence, so did Galerion, and the rivalry between the two former Psijics culminated in a battle near Ceporah Tower between Galerion's followers and Mannimarco's followers and their legions of undead. At the end, Mannimarco and Galerion were both thought to be dead, but Galerion's forces claimed victory that day. But it proved to be a pyrrhic victory, as Mannimarco had transformed himself into an immortal lich. And as a final disgrace to his rival, he had purportedly made Galerion his thrall. Though they would disappear for decades at a time, Mannimarco and his followers inevitably returned to plague the Mages Guild and Tamriel with many nefarious plots for centuries to come. Their influence over the evolution of the arcane arts was considered pervasive. Galerion suspected that the Order was responsible for soul trapping, a subset of necromancy, becoming a commonplace practice among mages across the continent. Officials in various locales have proven susceptible to turning blind eyes out of fear or greed. Mannimarco was reportedly killed at the end of the Third Era, though his followers believed that he had actually achieved divinity, and could not truly die. Regardless, necromancy has certainly lived on. Corpses decay rapidly in Black Marsh, making it very difficult for necromancers to operate. This problem is compounded by disease, militant tribal Argonians, and the many other difficulties presented by life in Black Marsh. Argonians practicing necromancy is a rarity, since they live in the present and they perceive the dead as being meant to be left in the past. Some tribes like the Veeskhleel commune with the dead and have earned a dark reputation. A few Sload necromancers have purportedly operated in Black Marsh with success, though even they stayed near the coast. 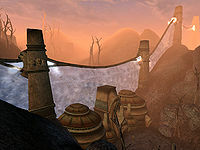 Despite the bans on necromancy in Morrowind and within the Mages Guild, it technically remained legal in Cyrodiil. In fact, there have been many times in the history of the Imperial Province where necromancy was extensively practiced, and even publicly tolerated. The only known period that necromancy was supposedly abolished across the Empire was during the reign of Reman II in the late First Era. Ayleids, the long-lost elves of Cyrodiil, are thought to have possessed extraordinary necromantic knowledge. Their utilization of undead armies is well known, though legends speak of pacts they made with the Daedric Princes rather than their necromancy skills directly. Some of their city-states openly practiced necromancy for untold generations in the Merethic Era. The city of Abagarlas, which became a center for worship of Molag Bal, was particularly infamous for the hordes of undead they sent against their enemies. Elsweyr is said to be relatively accommodating to necromancy. The Khajiit are said to show little if any outrage over uncovered graves, and corpses can apparently be purchased in the port of Senchal. Though corpses don't hold up well in the forests, the deserts of Elsweyr preserve corpses for centuries, allowing skilled necromancers to make use of them relatively easily. The way the bodies are buried in the deserts, under only a small cairn of stones, is also ideal for necromancers on the prowl for resources. Though the vast majority of Redguards abhor necromancy, their deep devotion to their departed ancestors has also led them to abhor any sort of interaction with the undead, which has left them particularly vulnerable to necromancers. It seems their revulsion for necromancy has contributed to their aversion to the use of magic in general. The Ash'abah are a tribe of Redguards who have made it their duty to purify mausoleums and destroy the undead wherever they may be found. Due to their contact with the dead, they have been treated as a necessary evil by an ungrateful mainstream Redguard society. They are exiled to live as nomads in the wastes of Hammerfell, forever hunting their foes. In the First Era, as part of a covenant with Tu'whacca, three Ansei warriors sacrificed their souls to create the Ansei Wards - magical relics that prevented even the most powerful necromancers from raising their dead. Orc corpses are highly sought after by necromancers for their durable skin and strong bones. A group of necromancers actually tried to establish a trade in Orcish corpses with Orsinium near the end of the Third Era, though it's unknown what kind of reception they received. Necromancers have typically had to operate underground in High Rock, as the citizenry generally find it despicable. Nevertheless, travellers might find themselves at the mercy of a necromancer if they're unwary. The so-called Gravesingers, the most powerful of the Witchmen of High Rock, are said to have an extraordinary talent for controlling the dead. During the Alliance War circa 2E 582, one of these Gravesingers, known as Angof, defiled Cath Bedraud, the great cemetery of Breton nobility, and sought to take over all of Glenumbra. 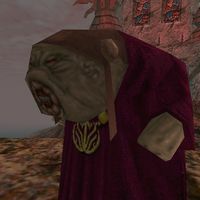 The Lion Guard of the Daggerfall Covenant, which was staunchly opposed to necromancy, eventually succeeded in driving back and defeating Angof. A group of necromancers trafficking in bodies on the island of Betnikh were also cast down around this time. Nevertheless, necromancy would plague High Rock for centuries to come. In 3E 253, the people of Dwynnen found themselves under the heel of a lich and his hordes of undead, though he was famously defeated by Othrok, the future Baron of the land. In 3E 267, Baron Othrok led a coalition of High Rock nations to defeat the Camoran Usurper, whose undead armies had been laying waste to western Tamriel for over a decade. Long-standing tradition mandates the cremation of most Breton dead, especially in northern High Rock. People in the south, however, often follow the Imperial custom of having a burial tomb, which means there are cemeteries, like Cath Bedraud, which can be exploited by necromancers. High Rock is prone to war, and many practitioners find their resources on the battlefields. The sewers of Wayrest are also said to cater to the black market necromancy trade. Breton folklore does not attribute every spirit wandering their land to an act of necromancy. "Hauntings" are thought to occur when a person died and their spirit simply did not want to leave. They are considered common in some locales, such as the moors of Glenumbra. This distinction the Dunmer made was essentially meaningless to the human races, as the Dunmer considered them and some other beast races to be little more than animals. While the Dunmer considered the necromantic manipulation of another Dunmer abhorrent, they did not prohibit the practice of necromancy upon human remains, or on the remains of any animal, bird, or insect. The Telvanni, in particular, became renowned for their mastery of necromancy, though it is said even they will not defile the corpse of a fellow Dunmer. Under the Third Empire, Imperial officials recognized the practices of Dunmeri ancestor veneration and spirit magic as a religion, and protected their freedom to pursue such practices so long as they did not threaten the security of the Empire. Privately, most Imperial officials and traders purportedly believed the Dunmeri practices were necromantic, or at least barbaric. Over the course of the Third Era, Dunmeri views on necromancy evolved. By the end of the era, the practice of necromancy upon any of the "accepted" races was generally viewed as an abomination. Circa 3E 427, Morrowind was the only province in which necromancy was outlawed. However, necromancy remained viable in the province for a time due to the Dunmeri practice of slavery, which had long allowed necromancers in Morrowind to obtain as many fresh bodies as they could afford. 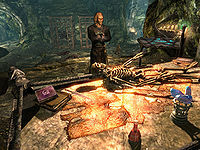 In ancient Skyrim, the mighty Dragon Priests of the Dragon Cult buried their followers with them, conscripting them through necromantic rituals to serve them in death. Every night, a different shift of draugr rise to prostrate themselves before their master, transferring their life force in order to preserve him, and then return to slumber and recoup their own undead energy. 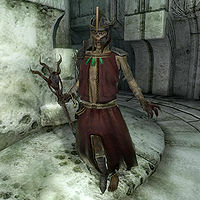 These "restless" draugr are considered somewhat different from other draugr which have been raised by a necromancer (the term "draugr" can be used to refer generally to any Nord undead). This practice of binding servants to their master in death was apparently abandoned by the Nords following the defeat of the Dragon Cult in the Merethic Era, which was eventually eradicated in 1E 140. The ancient Nords were also known to encased tombs with an enchanted form of ice known as Stalhrim to protect corpses against necromancy, however this practice also fell out of favor. Despite this, Nords apparently continued to inter their dead in much the same way. The many well-preserved bodies in barrows all over Nordic lands are essentially treasure troves for many enterprising necromancers, who can command even the restless draugr by imbuing them with loyal spirits. In modern times, necromancy is practiced in secret by many outlaws. Coming across a group of necromancers in some secluded cave or barrow is one of the many hazards any adventurer must eventually face in Skyrim. And at the prestigious College of Winterhold, it is even considered a legitimate arcane study, provided it is done discreetly and in accordance with the College's rules. As noted elsewhere, the Reachmen have a long history with necromancy unto themselves (though it has purportedly been forbidden in the past by some tribes). During the War of the Red Diamond, Potema, the Wolf Queen of Solitude, turned her kingdom into a "land of death". She and her necromancers raised armies of undead from their fallen enemies and launched assault after assault on the Empire until she was finally vanquished in 3E 137. Circa 4E 201, a cadre of necromancers attempted to summon and bind her spirit, but their efforts were foiled by the Dragonborn. The extraordinarily powerful spirit of the Wolf Queen was banished from the land before she could visit any further harm on the mortal world. The Summerset Isles was the original homeland of not only Mannimarco, but the Direnni clan of Altmer who are remembered as among the first to unlock the secrets of summoning souls. Nevertheless, the land of the Altmer is arguably even less hospitable to necromancers than Valenwood. 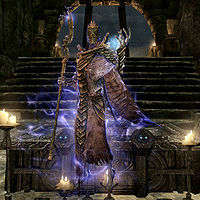 A few elite Altmer are allowed some study of necromancy, but their research seems to be centered around the extension of mortal lifespans, rather than the more conventional uses of necromancy. Regardless, these sanctioned necromancers are understood to be exceptions to a very strict rule. Any investigation into soul manipulation, including soul trapping, was considered akin to necromancy and thus forbidden. Unsanctioned necromancy in the Isles is subject to the worst possible punishments. The Bosmer of Valenwood are said to possess an intolerance for necromancy which "goes beyond all reason". Further, though they do not typically practice Arkay's rituals to protect the dead against necromancers, their practice of ritual cannibalism reduces the availability of corpses, making Valenwood a particularly difficult place for necromancers to operate. Their animosity for necromancy may be exaggerated, as many individuals show little concern over the reanimation of the dead. Long ago, when many Ayleids lived in Valenwood, they established the city of Hectahame, which was built on a site of immense power, the Heart of Valenwood. A necromancer whose name has been lost to history twisted the life-giving power of the Heart to raise a horde of undead so powerful that the city had to be sealed off in order to contain it. In 3E 249, the Camoran Usurper was able to collect a great army of daedra and undead in Valenwood, and took over the province in just two years. 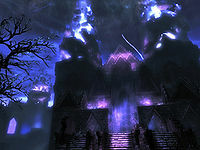 During the Planemeld of the Interregnum, Coldharbour, the Daedric Realm of Molag Bal, became the staging ground for Mannimarco's necromantic assault on Tamriel. The Castle of the Worm, built by soulless slaves in the realm, was the final stop for countless innocents before their souls were stolen and they too became undead slaves. Following the Warp in the West, the Order of the Black Worm came to believe that Mannimarco, their King of Worms, had ascended to become the God of Worms, as represented by the Necromancer's Moon, or the Revenant. The Order held that he would deliver them from the Day of Reckoning, and established altars that, when struck by the light of the Necromancer's Moon, converted grand soul gems into black ones that are capable of trapping the soul of a sentient mortal. 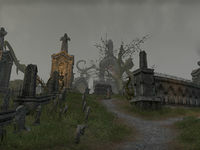 The Shivering Isles of Sheogorath, Daedric Prince of Madness, had its own style of necromancy and undead. Unique, shabbily-assembled skeletons of unknown origin called shambles are common in the many ruins in the Isles. One inhabitant, Relmyna Verenim, conducted necromantic studies on the Isles for years. She showed great skill in creating flesh atronachs. She was responsible for creating the first and second Gatekeeper, a giant flesh atronach charged with guarding the entrance to the Isles. Much of her work focused on the physical and psychological anguish which she was able to induce in her subjects. She dismembered them in various ways before resurrecting them and forcing them into combat, over and over again. She concluded that the effect of dismemberment was inconsistent within species, writing, "Whether beast or man, the removal of a limb, be it functional as a hand, or peripheral as a tail, has varying effects on the subject, having to do more with individual temperament than any biological or cultural endowment." Her study evidently had an enormous sample size. "Reptilian Appetite Conditioning" involved forcing a close, seemingly familial bond to form between reptiles of different species, and then attempting to get them to kill and eat each other. "Project Hound's Blood" involved the addition of zombie blood to hounds to make them more ferocious. In another research project, she tested the pain tolerance of pregnant females, eventually ripping them apart only to resurrect them again. She planned to make a guidebook on how removing bodily appendages from the population at large could result in a better society. Necromancers have been known to strike deals with the Ideal Masters of the Soul Cairn. In return for souls, the necromancers are given the ability to summon armies of undead from the realm, although they often fall prey to the Masters and end up trapped in the realm themselves. 1. One theory of the creatures known as Wispmothers in Skyrim is that they are actually powerful necromantic sorceresses from some forgotten culture who long ago turned themselves into some type of lich. 2. Mannimarco, King of Worms asserts that Mannimarco was the "first of the undying liches" of the world. 3. The author of On Necromancy is only given as "V", which is likely referring to Vastarie, given the author's expertise in necromancy and concern over tormenting the souls of the dead. 4. The author of Arkay the Enemy is only given as "KW", but this is presumed to be referring to the "King of Worms", Mannimarco. 5. 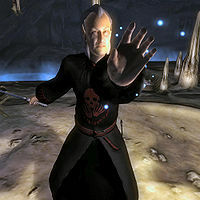 Ashlanders of Morrowind suspected that the Tribunal's extension of their lifespans was related to necromancy. 6. Among the Skaal of Solstheim, necromancers are exiled. 7. The Pocket Guide to the Empire, Third Edition: Other Lands refers to Mannimarco as "the hero of the Sload". The Order of the Black Worm reports of rumors that Mannimarco's cult had opened relations with the Sload circa 2E 582, though whatever dealings they may have had remain a mystery at this time. 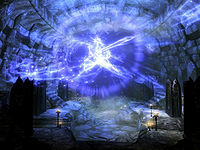 For game-specific information, see the Oblivion and Skyrim articles. Arondil's Journal by Arondil — The journal of Arondil's journey from studying necromancy, to creating an army of undead creatures. Blasphemous Revenants — A call for the destruction of all vampires and those who follow them! ^ a b Loadings screen in ESO. ^ Graring's dialogue in Bloodmoon. This page was last modified on 13 April 2019, at 13:58.